Born in Gorizia, Italy, Cleto Munari describes himself as a globetrotter, collector, and inventor. He met the prominent Italian architect Carlo Scarpa in the 1970s and, with him, started producing objects in precious metal. In 1985 he set up a workshop-studio for the manufacture of unique objects in collaboration with some of the greatest architects, designers, artists, and writers in the world, among them Mario Botta, Alessandro Mendini, Alvaro Siza Vieira, Mimmo Paladino, Sandro Chia, and Dario Fo. Munari has devoted a major part of his enterprise to producing glassware in Murano, assisted by some of the master glassblowers of the Venetian Lagoon region. His creations can be found in the permanent collections of major museums across five continents, including, in New York, the Metropolitan Museum of Art and The Museum of Modern Art. Among his most famous design collections is the Five Pens series—each pen is dedicated to a different Nobel Prize winning writer (Naguib Mahfouz, José Saramago, Saul Bellow, Toni Morrison and Wole Soyinka), from whom he obtained handwritten letters. He then asked five different renowned architects and designers (Toyo Ito, Oscar Tusquets Blanca, Alessandro Mendini, Alvaro Siza Vieira and Cleto Munari himself) to design a set of five beautiful pens. The finished writing utensils are luxurious and inspiring. 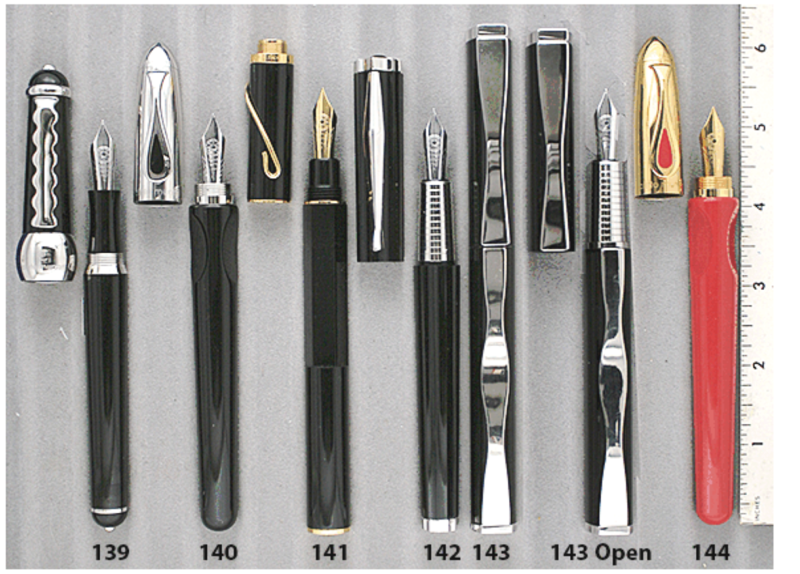 The writings that inspired the pens were collected into book form, which accompagnies each pen. The Book of Five Pens contains facsimiles of each of the letters, information about the authors and design features of each pen. The pens were made by Stipula for Munari. The original list price of the 5-pen edition was well over $3000, over $5,000 with the sixth pen we have added. Each pen has an 18K nib, is new-old-stock, mint, and presented in it’s individual box with all papers. We are fortunate to have two of the Oscar Tusquets pen, one in Black with rhodium-plate trim, and one in Red, with gold-plate trim. So while the edition is of five pens, there are actually six. Items #139 – #144 in Catalog #84.